An electric field generated between two electrodes inhibits the witting motions of fishes (anaesthesia). For certain field values, it is even possible to stimulate a directional forced swimming (electrotaxis). 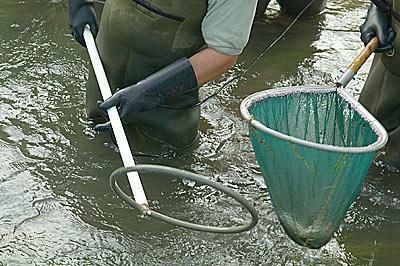 Thanks to that, fishes are attracted to an electrode where they can be caught using a dip net. For an optimum value of the field, the fishes recover from anaesthesia without any after-effect as soon as they are taken away from the electric field.